Get the best quality at the right price on soccer apparel from soccerloco to bring your game to the next level, both on the field and off. We have apparel for all weather and all ages. Whether you need a warm up jacket to put your soccer love on display in the cold weather or a comfortable tee to wear around town while showing off your team pride for the regional club you follow, we have the soccer clothes you need. You'll find shirts for every big team and many big name players in our online store. With top apparel brands like Nike, adidas, Puma, Under Armour, Warrior, and more, we're sure to have the soccer clothing you need to fill up your wardrobe. Shop our online store today and find the perfect fit for you. soccerloco has the best selection of shirts and other soccer clothing options so you can find something stylish and comfortable for almost any occasion. We have soccer apparel to cover you from head to toe with choices of hats and socks, all designed and built to enhance your fandom as well as your skill. A wide selection of top names in soccer clothing allows us to bring you the very best soccer clothes for every situation your love for the sport could improve. Enrich your life today with the best soccer wear online from soccerloco. Get the best soccer apparel online from soccerloco thanks to our large selection at the best prices. You'll find shirts for casual situations as well as referee apparel fit for officiating all kinds of league matches. Hassle free returns and flat rate shipping on all orders from the continental US means your clothing gets to you at an affordable cost so you don't have to sacrifice quality. Let soccerloco help you elevate your game or your fandom to the next level with anything from our wide options of soccer clothes for all situations. 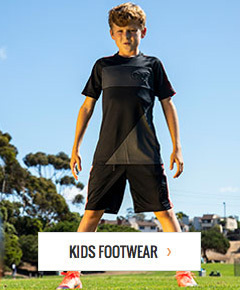 Shop online at soccerloco today to find the best from top soccer clothing brands.